Hi sweetie! I’m Ms. Cupcake and I originally hail from Canada, but moved to the UK many moons ago. I began baking from home when I couldn’t find indulgent bakery goods for vegans in London. 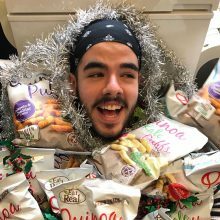 I soon realised that it wasn’t just vegans like me that weren’t being catered for, but also those allergic to different foods like eggs and milk, and those who didn’t eat certain things due to religious reasons. 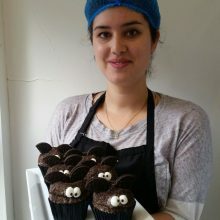 So I launched my small business from my home kitchen in the spring of 2010 and began by selling my vegan cakes at markets around London. I would describe my baking as classic North American with a British flavour twist. The rise from ‘small home business’ to where we are today has been meteoric! 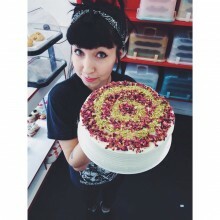 We opened the doors to our shop (London’s first entirely vegan retail bakery) in April 2011 and I was named the Baking Industry Awards Rising Star of 2011 in September of that year. 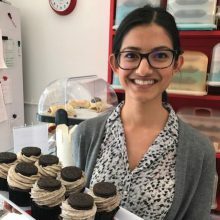 Our first cookbook – Ms. Cupcake: The Naughtiest Vegan Cakes in Town was released by Random House in 2013 and I’m currently writing our second book. 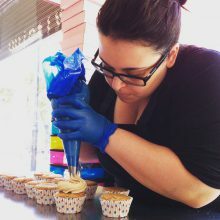 I created the Ms. Cupcake bakery and shop to be an open plan bakery so everything can be baked and decorated fresh onsite in front of the customers each day. Our menu now features cookies, squares, layer cakes, muffins, sandwiches and more – but we are still renowned for our decadent cupcakes. I’m the General Manager and self-proclaimed “Queen Cake Decorator”. I have been at Ms. Cupcake since the early days when the shop first opened. When I’m not putting a huge amount of icing on your cupcakes, I’m at home watching a tv series, having people over for my breakfast club or reading poetry. Favourite Ms. Cupcake product? I especially love our Milkshakes! I’m an Account Manager and the only northerner at Ms. Cupcake. My role is fantastic as I get to work with an amazing internal team, as well as the chance to build relationships with highly skilled and professional clients in the food industry. Outside of the office I enjoy walks, rock’n’roll and drinking Yorkshire tea. Favourite Ms. Cupcake product? The cookies are absolutely amazing, especially the ‘Red Velvet’ flavour. I joined Ms. Cupcake last year as Baking Assistant and I’m now a Duty Manager. Baking is a huge passion of mine and my colleagues are great so it’s a perfect combination working here! When I’m not baking I love walking around the parks in London as well as listening to good rock music. Favourite Ms. Cupcake product? Lemon and Poppyseed Muffin and Choc Chip Cookie…sorry couldn’t choose between the two! Hi! I’m Yuri and I’m a Bakery Assistant. I love fresh air, parks, concerts, relaxing at home with a good book, cycling and meeting up with friends – but mostly I love eating ALL the vegan food! 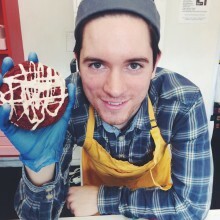 Working at Ms. Cupcake means you get to meet lots of amazing people and fill their bellies with incredible vegan treats! Favourite Ms. Cupcake product? I love the Salted Caramel cupcake more than anything – it’s perfect! I’m Jessica and I work in the office as a Sales and Marketing Assistant. When I’m not at work I love going to gigs to see my favourite bands and trying out new London restaurants. 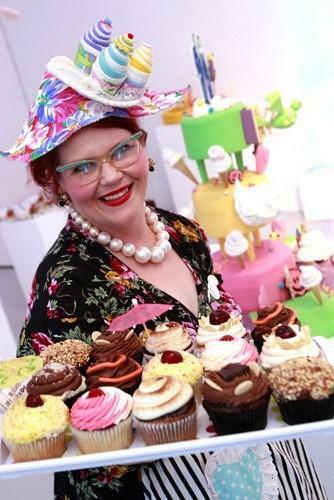 At Ms. Cupcake I love speaking directly to customers – whether it is on social media or helping them to select a bespoke cake for their special occasion. Favourite Ms. Cupcake product? I love the Oreo cupcake – it’s a classic! Hi I’m Violetta and I work in the shop as a Bakery Assistant! When I’m not busy baking or decorating I love spending time outdoors, cooking for friends and family and exercising! No two days are the same at Ms. Cupcake which allows me to take on varied tasks, surrounded by great colleagues! Favourite Ms. Cupcake Product? My fav things we sell are either our awesome tote bags or the yummy Peanut Butter Snap bar. Our Charity of the Month is Sea Shepherd!